The ins and outs of anchoring & staking. 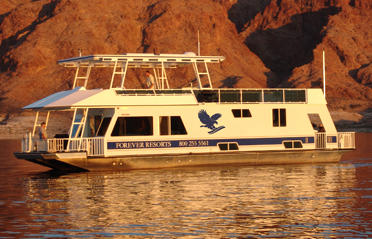 Navigating the open lake is half of the fun of any houseboat trip. Our houseboats are designed to move gracefully through the water so that everyone can enjoy a 360º view of the lake and shoreline. 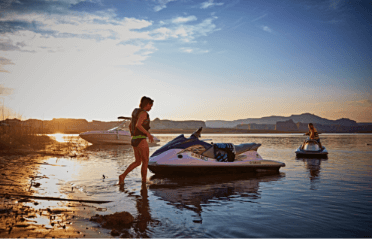 A powerboat or personal watercraft (a jet ski) comes in handy for scouting beaches and finding the right spot to tie up since they are more nimble near the shoreline than the houseboat. Before beaching your houseboat, you will first choose a spot out of the main channel and high-traffic areas, where there are no underwater hazards. A nice wide, sandy beach with plenty of room for setting up camp is what you’re shooting for. Once you’ve found the right spot to beach you will prepare the houseboat for beaching by turning off the generator (to avoid sucking sand or matter into the cooling intake). Then, from the helm (not the flying bridge if your houseboat is so equipped) you will approach the shoreline with your motors running typically at 800 to 1000 RPMs. At this low speed you will then ease your houseboat up to the shoreline – watching for any underwater hazards or unexpected shallow areas. Once you have beached your houseboat, you will keep your motors running at this low speed until you have completed securing the houseboat. It is important that the operator stays at the helm until the boat is secured and that passengers are not on or around the back deck of the boat when the motors are running and the boat is parked. 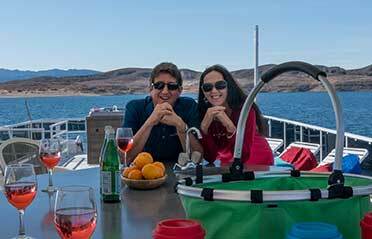 Start securing your houseboat by first throwing the ropes to the beach and then move your stakes or anchors from the front of the houseboat to positions approximately 45 degrees from the boat (see illustration). Use the provided hammer or shovel to either pound in your stakes or dig anchor holes. Sturdy work gloves are a good idea – you may want to bring your own to be sure you have them handy. If it is windy, start from the prevailing side – the direction from which the wind is coming from. This will help keep the houseboat in position during tie down. If the wind pushed the houseboat out of position, during tie-down, the operator can steer the motors and apply a slight amount of throttle to straighten the boat. To set the anchors, you will need to dig a large hole 2 to 3 feet deep and wide enough to accommodate the anchor. Drop in the anchor and tie on the rope. Set the anchors by alternately pulling and tightening the ropes. Fill the holes with sand to cover the anchor – you can even pour water over the sand to “set” the anchors if you wish. Tighten all the ropes at the anchors until the houseboat is secure. You can use the houseboat motors to further tighten the ropes by swinging the rear of the boat slightly toward the rope being tightened. Using your boat motors to do the work for you makes rope tightening easy and ensures that your boat is secure. Only after all ropes are secure should you turn the motors off. It is a good idea to clearly mark your stakes and anchors if they are showing above ground – even cover them with something so that they are easily visible in the dark.